It would have been easy for Northern Broadsides to do yet another play set in the trenches. An August Bank Holiday Lark, however, helps us understand why this came about in the first place. I’ve never been a fan of making people write plays to “briefs”. Theatre companies do of course have to consider what sells, but I’ve always felt that the more constraints you place on what a writer can write about, the less likely you are to get a good job out of it. Well, one person who feels differently is Deborah McAndrew, who considers these constraints an opportunity for inspiration. In theory, the brief for An August Bank Holiday Lark was quite simple: Northern Broadsides wanted to do a play about World War One on the centenary of its outbreak. In practice, however, it was a lot more constrained. For a start, there are plenty of plays about the horrors of the trenches, with recent successful tours of Journey’s End and Birdsong to contend with. They might have stood out from the crowd by doing a Michael Gove-friendly version where plucky British fellows under command of brilliant aristocratic leaders ensured victory for King George by December 1914, but they didn’t. Seriously, however, there was little enthusiasm for a trench-based play with a “northern” perspective. 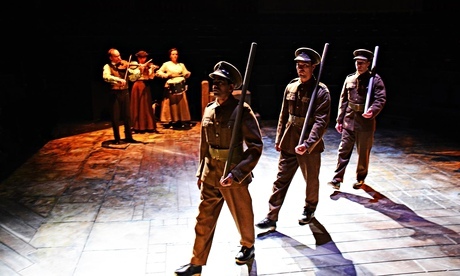 The lazy solution – the solution which artistic director Barrie Rutter suspects television would have done – would be to combines stereotypical northern poverty and misery with the misery and subsequent slaughter in the trenches. Then there was another constraint in play – in Lancashire, where this play was to be set, the enduring memory of the war was the Gallapoli offensive in 1915, when the Loyal North Lancashire regiment suffered its worst losses. As a result, a time-frame of 1914-1915 was suddenly imposed on the play. And there was one final constraint: the title suggested by artistic director Barrie Rutter was a line from Phillip Larkin’s famous poem MCMXIV. And it stuck. And what did was get from all these constraints? A play as far removed from the Western Front as can be. It’s set in a rural village, and for most of the play, the war is a sideshow. It begins with the Rushcart festival, complete with on-stage clog dancing courtesy of musical director Conrad Nelson. Attention is focused on who’s courting who behind whose parents’ backs, whose chickens have been uprooting whose flowers, and the ongoing thorny debate over whether women should be allowed to take part in the clog dancing. Normally, this would lay the foundations for a play that was dull, or frivolous, or both. Not here. What is remarkable about this story is how little attention is paid to the elephant in the room. And when the newly-declared war does get a mention? It’s an adventure, isn’t it? Alas, this is the story all over Europe of how the First World War came into being. Such are the terrible memories of 1914-1918 that it’s hard to imagine that anyone thought it was a good idea, but it was. In the few references given to the war, lads all over Lancashire are all eagerly signing up. Rural Lancashire is all very well, but who’d pick that over a chance to see the world? Yes, of course war has risks, but is it really any worse than the dangers of working in the mill? How could you make your parents prouder than signing up to fight the Central Powers? These may seem like the stupidest of stupid questions now, but that breathtaking naivety was normal back then. You can almost imagine enlisting to your doom as part of a Hovis advert. So there you are, proof that writing to a brief can work. This is not a play that portrays the horror of war – there are plenty of others that do that job. Instead, this is a play that shows the effect back home, and, more importantly, goes a long way to showing how easily people believed it would be “over by Christmas”. Northern Broadsides can be pleased with the Rutter/McAndrews collaboration, and it’s certainly worth catching on the tour. An August Bank Holiday Lark continues to tour until 14th June, including York Theatre Royal on the 1st – 5th April, and the Stephen Joseph Theatre on the 22nd – 26th April.